Knowledge is important. So what I learned and obtained I like to teach and share with my clients, family, friends, and anybody that need help. I am very confidence in my ability to understand and teach all aspects of fitness. I believe that Personal Trainers change lives everyday. I believe in all these methods.Weight training, cardio, stretching, nutrition, diet, aerobics, and meditation. All these methods will benefit clients and impact they life. I motivate my clients by pushing to limit and make sure they don't give up on they goal. And challenge their self, regardless of the obstacles. What motivate me to train? Making a difference in people life.I believe appearance, knowledge, dedication, and personality, is important to be a great Personal Trainer. My agenda is to help clients improve their body, their self-esteem, their self-respect, and above all, their good health. I believe every one's body is a temple. 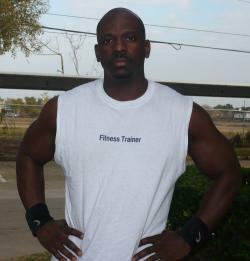 I'm certified by the International Sports Sciences Association as a certified Fitness Trainer. This certification is the most prestigious in the industry and qualifies me to work with virtually any individual wishing to improve their fitness. I studied, anatomy, physiology, kinesiology, biomechanics, physical fitness, program development, nutrition, injury, and disease. I also, obtain aed and cpr certificate from red cross and heart association.I graduated in 1996 at Cypress Falls High School.I also attend lone star college in computer programming, word, excel, access, and microsoft. I spend years in public health clubs, gyms, and seminars, learning from fitness professionals. I've been training since 2009 and have trained more 13 clients in my career. My clients is able to reach their goal with my fitness program. My name Sidney Carter.I was born in Houston,TX.I'm current living in Houston.I'd like to tell you bit about myself. I'm certified by the International Sports Sciences Association as a Certification Fitness Trainer. I devoted my life to fitness. Helping clients to achieve their goals. My clients always tell me that i'm always energetic. And with that energy that give them that extra push they need. One of my greatest assets in life that I have the ability to motivate and inspire people.